Having given birth to a dozen – yep, that’s 12 – puppies, Shiloh is one tired mom. With so many puppies comes so great a need and the people of the Comox Valley generously reached out with donations of food, puppy milk replacement and pet supply gift cards. The Comox Valley Branch of the BC-SPCA is holding an open house fundraiser to help raise money for Shiloh, her pups and all the other animals at this very busy shelter. When: Friday, March 25th from 7:00 p.m. until 11:00 p.m. The evening features prize games, a 50/50 draw and a silent auction with amazing items including a Krupps grinder, a deluxe espresso machine and a one-month membership to the Comox Valley Boxing Club. If you can’t make it to this fundraiser, feel free to drop by the Comox Valley shelter at 1668 Ryan Road in Comox – or the shelter in your community – at any time with your donation of food, toys, money or gift cards. 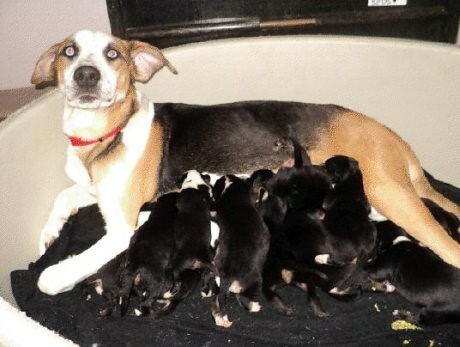 Please let Shiloh and her dozen pups be a reminder to have your pets spayed or neutered. ← BC Shellfish Festival – Win A Trip!